The POLA 3000 is an online particle size and shape analyser especially designed for the analysis of free flowing powders and granulates over a size from from 40 microns to 100mm. 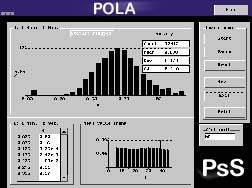 The POLA 3000 is a specially designed system for online particle analysis that integrates a number of different components into one complete unit. 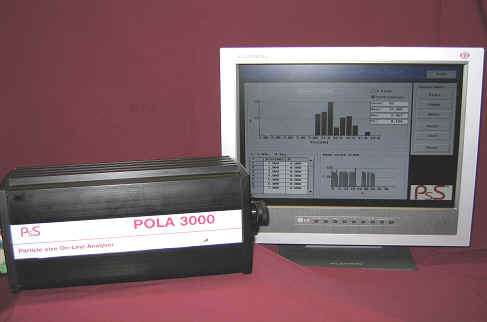 The POLA 3000 is based on an image analysis principle and has a ccd (charge coupled device) built inside the unit. It also has a computer in the form of a chip inside so that no external pc’s are required, which are easily damaged in harsh environments. All the electronics such as frame grabbers and synchronisation electronics to control feeders for supplying the particles to the POLA 3000 for analysis are also inside the sealed case. The data outputs can be in the form of rs232 or, more usually rs485 or rs422 in process situations where data needs to be transmitted long distances. The data is in the industry standard protocol ModbusTM, thus making it easy to interface with plc systems that are already on the process line. The whole system is powered by 24 volts, thus reducing heat problems associated with high voltages. Once images of the particles have been acquired, each image is analysed continuously and the data put into database which can be transmitted to the plc at regular intervals. There are also four digital outputs that can be used for data transmission and the system is designed to run 24 hours a day, 365 days of the year. On-line, real time Particle Size and Shape Analysis. using industry standard Modbus™ software. Continuously inspects and Analyses your product in real time. Small compact unit. Fits easily into small areas. Size range from 40 microns to over 40 millimetres. You can adjust and define the analysis parameters according to your needs including setting the length of the SPC data collection periods to assure statistically valid results for your unique process. Operating at 24 V the POLA 3000 can be used into a variety of production environments, and is designed to integrate directly with existing process control equipment using industry standard Modbus™ for monitoring process trends and performing production corrections. 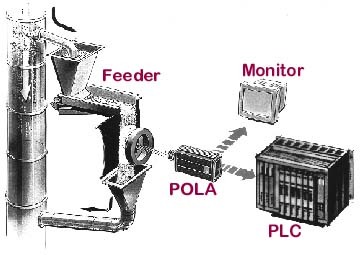 The POLA 3000 utilises a 4 - 20 mA loop to control other devices such as a feeder.